The recent earthquake and tsunami, and the subsequent fears over nuclear radiation have prompted many to turn to the Web for advice on disaster preparedness. Online lookups for "disaster kits" and "how to make a disaster kit" have both more than tripled during the past week. In short, folks are wondering, what they should have in their kit? Opinions vary depending on what sort of disaster you happen to be preparing for. However, most experts, like the Federal Emergency Management Agency (FEMA) and the Red Cross, agree that the following items are essential. This is the big one. You must have plenty of water. Just how much? FEMA, the disaster preparedness wing of the US Government, insists that you should have at least a three-day supply. A rule of thumb -- have one gallon of water per person per day. If you happen to live in a hot climate, you'll want to increase that amount. "Very hot temperatures can double the amount of water needed," the site writes. Also, keep in mind that children, the elderly, nursing mothers, and people who are ill will need more water. Of course, you'll want to store the water in non-breakable containers and keep an eye on the expiration date. Water doesn't spoil in the traditional sense, but it can taste bad after a while. There's no telling what you'll be faced with in the wake of a disaster, but a few basic first aid supplies will certainly come in handy. 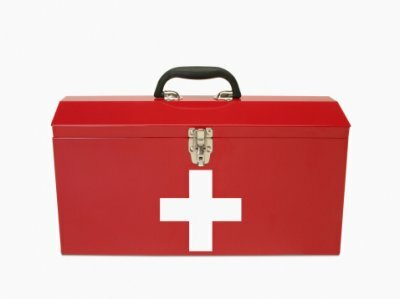 Again, according to FEMA, you'll want several bandages of various sizes, gauze pads, adhesive tape, scissors, tweezers, antiseptic, a thermometer, antiseptic, petroleum jelly, sunscreen, safety pins, and more. You'll also want a good supply of non-prescription medication, including aspirin, anti-diarrhea medicine, antacid, laxative, and some poison control supplies. For a full list, check here. Like water, you're going to want a healthy supply of non-perishable food should the unexpected happen. The American Red Cross writes that you should have a three-day supply ready in case you are forced to leave your home. And you should also have a two-week supply in the event that you stay in your home. Of course, the food should be easy to open and prepare. This mostly applies to people in cold-weather areas. Should disaster strike, have some warm clothes at the ready. You'll want to have at least one complete change of clothes for each person. FEMA suggests a coat, sturdy shoes or boots, long pants, gloves, hat, scarf, thermal underwear, and rain gear. You'll also want to have plenty of blankets, sunglasses, and various sanitation supplies like soap, toilet paper, detergent, and more. Just a few things you'll want to have on you: battery operated radio and batteries, flashlight, cash, nonelectric can opener, pliers, compass, matches, signal flare, paper and pencil, wrench to shut off household gas and water, whistle, and map of the immediate area. Important documents like IDs, birth certificates, credit card information, prescription numbers, and extra eyeglasses are also good ideas. Again, this is just a partial list. For the full list, please visit FEMA.gov.